On Saturday 2 December some forty members of the Club assembled to celebrate another successful year, to present trophies to the many winners of the dinghy racing series, to eat a fine three course Christmas dinner and to shake a festive leg on the dance floor. The venue was The Weir, the stunning glass-walled restaurant (and wildlife centre) a little way up the river from Bude. The members were perhaps a little unused to seeing each other in heels, dresses, collars and ties rather than in wetsuits or drysuits and rubber boots. However they were soon raising a fine hubbub and attacking their dinners. The presentation of cups followed: Jane Anderson, whose name will be well known to readers of this website’s reports of the racing at Tamar, had another fine season, winning seven of the series. The Club has an admirable record for promoting and rewarding junior sailors and there was a big welcome for the winner of the Peter Pocock Cup, Marlo Graham. When the trophies were all presented the Club’s own in-house disc jockey, John Weller, started the dancing music; a rockabilly soundtrack that made clear that the sailing club has been thoroughly infiltrated by members of the Bude Jive Club! The Club’s gratitude was expressed to the out-going officials, Commodore Sue Murray for all her hard work and enthusiasm over the past two years and also to Rear Commodore Linda Spiller, for whom organising the highly enjoyable Christmas Dinner was the last of the varied programme of social events that she has brought to fruition. Thanks were also expressed to Mandy Pollard, the Club’s secretary and photographer extraordinaire, who does so much for the club behind the scenes. Thanks to Adam Hilton for the report and Mandy Pollard for the photos. “Surfing in the treetops….sounded like a fun way for sailors to spend a social day out together in Sept. We were a brave party of 7, meeting up near Tavistock on the brink of the Tamar valley. Briefed and kitted out we cheerfully followed our young guide to the first of 3 leafy routes. One of us should have known better, having ventured on a similar expedition previously, but the rest of us were blissfully ignorant…. Sight of the first “bridge” of wobbly wire with scattered plank stepping “stones” should perhaps have made us think twice, but we gamely set off. Once away there was little choice of return and we soon found ourselves over 50′ off the ground as the valley dropped away from us. The beech trees were magnificent…I hugged each one as I reached the end of another swaying span, where the only stabilising hand hold was usually the overhead wire to which we were harnessed. Footings were lost and rescues were required. It was all much more scary and strenuous than we’d anticipated….but we stubbornly persevered, after briefly touching solid ground, through courses 2 and 3…. up swinging wire ladders, down zip wires to fly into suspended nets, around obstacles and off a sheer drop…in dumb, fearful concentration. No, don’t look down, Bob! I didn’t know it was going to be quite like this…..
Aargh….. enough to give you nightmares just looking at it…. And if it’s not bad enough being that high up, then there’s a zip wire to traverse as well…. 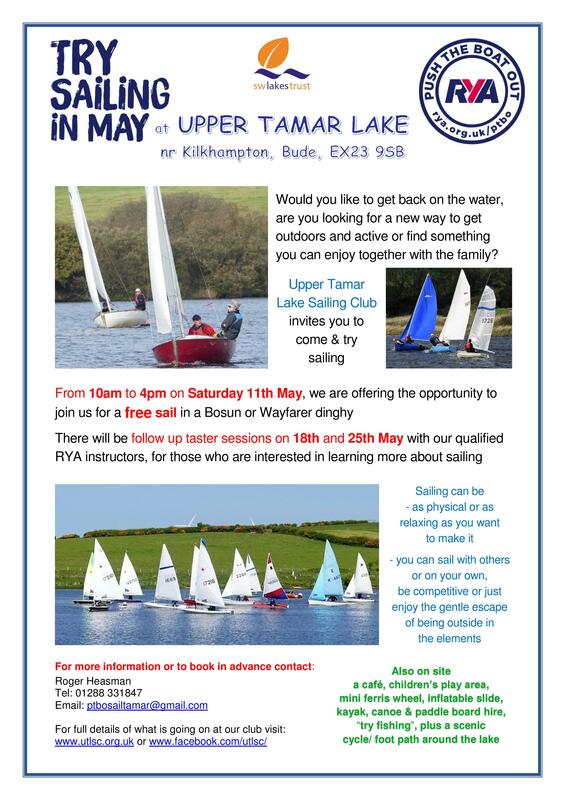 This is becoming an annual event for our Club, taking place at Roadford Lake, with the emphasis on reinforcing friendships amongst our members in a non-competitive sailing/camping environment. The dates selected for this year were 28-30 July, and 15 members and 1 guest participated in one way or another: sailing, camping, eating, chatting. The general forecast offered a rather challenging combination of heavy rain and strong winds throughout the two days. However, we were relatively lucky with the timing of these weather events. A dry Friday morning allowed tents to be pitched, masts to be raised on the Club’s Bosun and the Pollard’s Tasar, and both boats launched in a moderate SW breeze. Brian and Nathan set off with their Tasar, intent on demonstrating how their boat could perform, given sufficient wind and the greater space provided by the Roadford Lake. Roger, John & Sally soon followed in the Rob Easton Bosun, sporting small sails, so Roger could provide sailing/helming instruction to Sally. John provided the ballast. Whilst we were enjoying a picnic lunch ashore, the wind strengthened considerably, so the afternoon sailing experience was somewhat boisterous, exhilarating, memorable and wet. Unfortunately, the increased wind also heralded the start of rain. The combination of the two elements didn’t take too much encouragement to abandon the planned barbeque for that evening and retire instead to Launceston for a traditional fish and chips supper. Saturday morning dawned bright and sunny with a much-abated wind. Toby arrived, and his Lugger Tiz Viddy was rigged and launched. Roger took Sally out again in the Bosun for more sailing instruction; Brian and Cilla went out on the Tasar; and Toby, John and Mandy (yes – Mandy!) had a pleasant gentle sail across to the cafe where they joined the other sailors for a morning coffee before returning back to base. Bob had arrived now with his RS200, followed by Sue and Alison. After a communal picnic lunch, all boats were launched again. Rain threatened and eventually started, but failed to deflect the sailors from another enjoyable sail. By late afternoon, the rain really set in and it was to continue for the rest of the night. Additional members joined us for a very welcome dinner at a local hostelry The Clovelly Inn. Luckily, the rain had stopped by the morning, allowing an orderly striking of tents and early departure. There are some occasions when sailors are happy with no wind and calm water. Such a day was that chosen for our rafting expedition from Watermouth Cove, near Ilfracombe in early July, where we were delighted to find a gentle breeze and smooth sea awaiting us. We met up for a picnic lunch by the beach, enjoying the sun, before it was time to get kitted out in wetsuits and helmets. Then we were given a difficult choice – squashing 8 of us cosily onto one raft giving us maximum paddle power, or taking 2 rafts so we could be competitive? We chose two. Paddling a raft without the help of a co-operative current turned out to take rather more effort than some of us had thought and it was much easier to spin in circles than progress in a straight course. However, a little practice made some improvement and we set off towards Coombe Martin…… as far as a spectacular beach a short distance away! There we had the chance to swim and start a camp fire Bear Grylls style (well done to Dave), ready to toast marshmallows. ….But not too tired for a go at coasteering! Jumping from rocks into deep water proved great fun and we all emerged with a satisfying sense of achievement, not least from surviving a “dodge the jellyfish” swim to shore. By this time we had all built up a healthy appetite. A fish supper at The Pelican in Bideford lived up to it’s high recommendation – a great end to the day. All at sea…? Far from it…. Dave and Annie lighting the fire: Ray Mears would be proud of them.. Midsummer Madness ‘: the clue is in the title, In a bid to add some fun events and extent the Wednesday evening sailing a midsummer madness evening was suggested. Nobody quite knew what this was going to entail until the evening, but once the inner child in everyone was released, everyone had fun on the water with balls, buckets of water, paddle boards and canoes. There was still a surprising amount of competition involved . The madness continued when the evening went from the perfect summer evening to fog rolling down the lake and John Buckett’s Bass Boat looming out of the fog. The fog was just in time for the BBQ! Not to be put off by the weather Rachael’s boys ended the evening in the spirit of the event with a water fight with Roger. This was our first BBQ of the year and enjoyed by all . A large group of convivial Tamar club sailors gathered in the Boatshed cafe, overlooking the embarkation quay at Plymouth’s Barbican, eager and ready for a river trip to explore the lower reaches of the same river whose headwaters feed the reservoir that they routinely sail on. Rear Commodore Linda Spiller had done her usual immaculate job of making sure that everybody got to the right place at the right time, a task made considerably harder by the fact that maintenance work on the Sutton Dock lock gates had barred access to two of the area’s larger car parks. After boarding, most of the party found prime places in the open on the upper deck of the ‘Plymouth Princess’ and in a mixture of sunshine and scudding clouds, we we were soon off across the top of a slightly choppy Plymouth Sound, but once past Drake’s Island and through the Narrows, the water calmed quickly and everybody could take in the buildings of the vast naval dockyard to the right and green acres of Mount Edgecumbe park on the Cornish bank. Passing the former old Saltash ferry slip (where UTLSC members once regularly launched their boats on day sails, in a dim and distant past) and under the shadow of the twin Tamar bridges, the naval infrastructure was soon replaced by attractive rural countryside – as Roger Heasman remarked, equally beautiful as the much better-known River Dart. With help spotting egrets and herons from the eagle-eyed Dave and Cilla, there was lots to look at, but as we started the huge meander at Weir Quay, the skies darkened ominously and by the time we disembarked at Cotehele Quay, it was raining hard enough for most people to make a dash for the refuge and refreshments of the ‘Mount Edgecumbe’, just a few steps from the riverside. Afterwards, people examined the exhibits in the Discovery Centre and outside, looked at the sailing barge ‘Shamrock’ in the dry patches, before forming an orderly queue for the ferry returning back from Calstock. This time most people opted to go under cover on the lower deck, though a couple of foolhardy club members were determined to show that sailors are tougher than ordinary mortals and sat in wet-weather gear on the top deck rather longer than it was sensible to do so… As the boat returned to Plymouth, however, the skies cleared again and it was a cheerful group that once more disembarked at the Barbican, ending a thoroughly enjoyable day. As more than one person commented, without the impetus of club-organised trips such as these, many of us would probably never get round to going on a lot of the South-West’s attractions that the UTLSC social programme takes us to; many thanks once again to Linda for making it possible. Saturday 13th May 2017 saw Upper Tamar Lakes Sailing club hold another very successful RYA Push the Boat out Day. ‘Push the Boat Out day ‘ is all about getting people out on the water locally and giving them the chance to find out just how easy it is to get involved. The sailing club adopted a pirate theme for its popular rides in its ‘pirate boats’. It was a real family day out and it is always popular with families with young children. All the sailing trips were fully booked with 98 people signing to go on the water . The weather stayed fair, although the wind was a bit tricky at times and one pirate boat lost its rudder , which added to the excitement..The success of the event is all due to the commitment of club members who volunteer on the day to make it a success doing various jobs from helming the boats to keeping everyone fed and watered. Over 25 club members volunteered on the day this represented approximately two thirds of the members. I’m sure you can see from the photographs that every one had a great time. It is a date that is now firmly fixed in the clubs calendar. Thanks to Sue Murray, Commodore, for the report and to Mandy Pollard, Secretary for the excellent photos, including some close-up on-the-water shots. Looks as if pirate captain Toby is about to intercept the rival pirate ship sailing on his waters…. Great start – perfect weather for our first outdoor social of the year, a cycle ride along the more peaceful upper stretch of the beautiful Camel Trail, from Dunmere to Wenford Bridge. Accompanied by the sound of birds and rushing water, it was a steady but not hard pedal along the wooded valley, past primroses, some pretty cottages, a rather nice silver fish sculpture and finally the impressive ruined clay dries at Wenford. The Snail’s Pace Cafe provided an excellent, relaxed lunch before an easy pedal back, when some of us took the chance to explore the ancient Hellandbridge and the gardens at Paul Jackson’s pottery studio – well worth the look. Oh to be in England & etc ……. A ceilidh was a great chance to shake off any winter blues and get together before the start of our sailing season and Launcells Parish Hall was transformed by fairy lights and bunting, so the stage was well set. With fabulous playing by fiddlers Nick Wyke & Becki Driscoll, together with talented young accordion player Jack, the floor was full for every dance. Varied moves kept us on our toes, but Nick’s calling was so clear, there were few instances of dancers skipping off in the wrong direction. A break for supper enabled us all to get our breath back, before we were off again. Even a few reticent “wall flowers” were tempted to give it a go by the end of the evening. And everyone in motion, with no sign of collisions….